Made a new test during Friday evening, at first the real time data worked fine in the driving mode and I received the data in ABRP that was uploaded by LeafSpy. However unfortunately it stopped working after a while and I also saw some error messages in LeafSpy (they disappear so quickly that I did not get a screenshot). Regarding display SoC and Gids, I need to read further on the topic to be able to give some input. But probably it is best to base it on Gids as Gyula proposes. @Gyula, do you know if the lower end of the SoC window is fixed (ex LBW, VLBW and 0% display SoC) and it is only the upper end of the SoC window that shrinks with decreased SOH? I guess that would make it simpler. Saw that one in the log, had a divide-by-zero error that should be solved now. Great to see that you're seeing data in driving mode now! Ah ok, perfect! Will try again but will take some time until I have access to the car. I get this error every 2 seconds or something in leaf spy, I'm not really sure if it's related to ABRP. @Jilldris what do you mean by real time data in ABRP ? Yesterday when I was trying ABRP, I saw the percentage where the car should be, but did not see data from leaf spy. @Jason (ABRP) how can we now that our data is sent correctly to you ? On Thursday I made a test Liege to Gembloux (Belgium) and yesterday Liège to Brussels and back to Liège. @Benja - That error means I'm still sending the wrong response from the server. Torque expects one kind of response, and I haven't quite figured out how to format the response the way LeafSpy expects, I suppose. If it's any consolation, I do see some data from several leafs, so it's likely yours is one of them! Send me a PM if you want me to check on your information directly, so we can figure out which one is yours. I am working on a telemetry display so you can just look at a little page on the planner to see your data and confirm it exists. To use the LeafSpy data while driving, all you have to do is get LeafSpy flowing data to the server, then start a plan on the website, it'll ask you if you want to use the live data to start the plan and then when you start driving it'll show you a graph tracking your progress versus the planned progress. Word of warning, I still have some naive assumptions about the SoC percentage, so it won't quite match the plan yet. I was wondering, is ABRP takes into account the speed charge drop when battery exceeds 60% ? Lemon-Tea Leaf has a excel sheet with relevant data about T°, SOC and speed of charge. It would be great if ABRP could use these data to calculate the charge duration. As a matter of fact, we do take that into account! We used charts like the ones published by Fastned (link) to create the charge curves for the various Leaf models. It should be very close to what you actually experience in the vehicle. I will also note that we don't take battery temperature into account when charging yet. Sometime in the future, perhaps. Is it possible to say something about how much data that is coming in trough the data upload for Leaf 40kWh and how much more that is needed before it is possible to make a comparison against the theoretical consumption model? Couple initial comparisons from a brand new 2019 LEAF, almost all freeway driving using cruise control set at the speed limit. Obviously very limited data, but so far the battery usage has been close to the ABRP estimate, except when heated seats and heater are in use, when it can materially exceed the estimate. Let me know if there's a more helpful way I can provide this information than simply dumping it in here. That's perfect, actually, great to know our alpha estimates are quite close! I see you adjusted the temperature in those plans, I assume to match the temperature of the day? 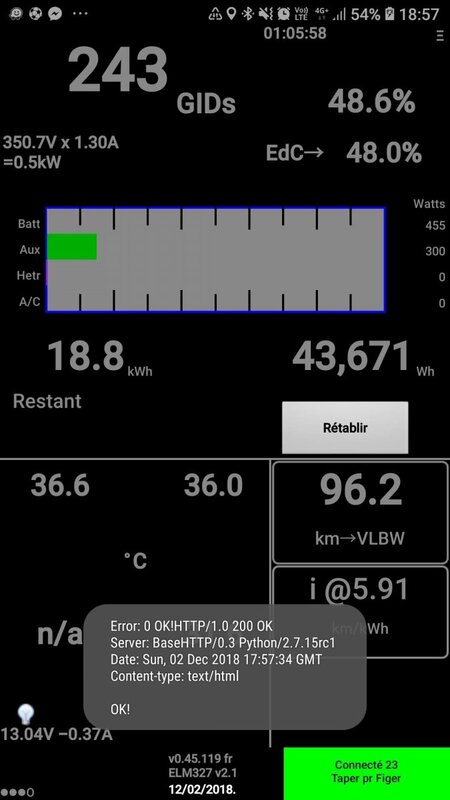 If you adjust that display using the arrows to match your actual SoC (or tap the middle of the battery if our number is accurate), we'll log that and use that to improve our Leaf model. I see you adjusted the temperature in those plans, I assume to match the temperature of the day? That's correct, although it looks like I forgot to adjust the last one. It's not far off though. I also added extra weight for another passenger + cargo, trying to get as close as possible. As far as the interface in your screenshot, am I just supposed to record the SoC whenever I am able? Yep, once a published charge curve is available, I suppose I could estimate it, but given that this is the first Leaf to charge >50kW, I think I'd end up pretty wrong. That and there are substantial differences between the 24, 30, and 40kWh variants already. Yes, exactly! If our prediction spot on, tap the middle of the battery icon. If our prediction is off, adjust using the < > buttons. Either way, it will get logged and we can use it to improve the model. Yesterday I managed to submit SoC for one route, but another I couldn't get to work. I didn't want to have my phone open while driving, so I open it when I arrived at the destination. The first time it reflected that I was now at the destination and gave me the estimated SoC, which I adjusted and submitted. However the second time, it did not acknowledge that I had moved at all and still showed my location as the being the starting point of the trip. Probably just unreliable from having the phone asleep while driving, but it would be nice to support that if possible. Yep,﻿ once a published charge curve is available, I suppose I could estimate it, but given that this is the first Leaf to charge >50kW, I think I'd end up pretty wrong. That and there are substantial differences between the 24, 30, and 40kWh variants already. 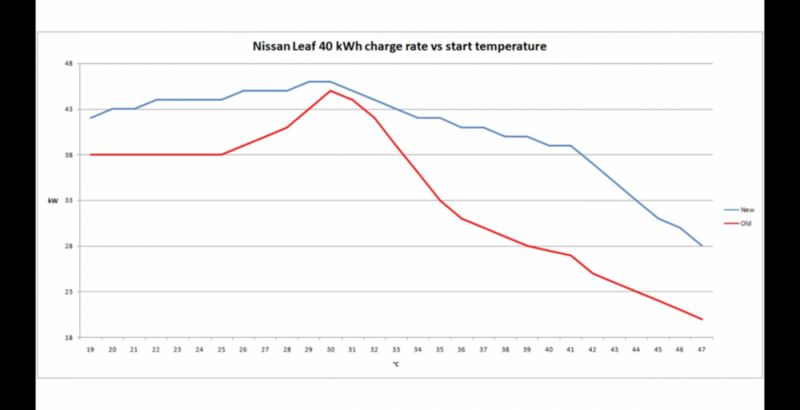 Do you use the new charge curve of the Nissan Leaf 2? Or the old "rapidgate" curve. Very likely. iOS and Android both squash webpages in the background. Not easy to do from a website, but will be much more doable when we get around to building an app. I don't see an entry in the system for you (anything resembling stefan), and I see a lot of logging of "unknown user tried to send us data", so is it possible you have not yet registered on the planner site? We use the non-rapidgate "ideal" charge curve for the 2018 leaf. When I get some time I will try to guess the Leaf e+ charge curve so we can get that in the planner and give it a shot! I recorded a 250km trip including 3 fast charges earlier this week but I have no way of knowing whether it was successfully sent to ABRP. Obviously i can tweak numbers such as reference usage @ 110km/h and battery degradation to get a match between my data and ABRP. However your numbers don't exactly line up, regardless of actual results. https://abetterrouteplanner.com/?plan_uuid=7d5ca443-9203-4f00-a84e-2d3c4091636b is a 249km trip averaging 6.22 km/kWh. Battery usage is 208% of capacity and working that backwards it implies the battery capacity is 19.2 kWh. The saved settings for this are 24 kWh model with zero battery degradation. That should be a (usable) battery capacity of around 22.5 kWh. Incidentally the speed limit in NZ is 100km/h - any chance of being able to put in reference usage @ nominated speed? For our car it appears to be about 5.7 km/kWh at 100 km/h and I have modelled using 5km/kWh @110. Here is my basic analysis of the trip data using both dash and Leafspy log data. The last couple of columns are my estimates of usable capacity and numbers below the table are totals for overall efficiency calculations. At the moment when I put imperial into settings it still stays on KmH any chance of giving us Mph in the planner? Also it would be nice to have the choice to keep Celcius even with Imperial settings. We made a trip last weekend. After adjusting the consumption which seems to be ~200wh/km now in winter the prediction was very accuracy. And I really liked the mapless mode! Well done! A couple of times I had problem with that LeafSpy lost connection and reconnected again. It might be my OBD adapter that is not that good. However everytime that happend it seemed to send strange data to ABRP. At least some times if showed negative SOC value which caused a dip in the actual SOC plot, see picture. Is there some possibility to detected this and filter this kind of rubbish data? Another thing I noticed was that actual SOC is no longer the same value as showed in LeafSpy. I guess you have added some kind of calculation to estimate the SOC shown in the car display instead. Is that correct? Unfortunatly it did not correspond so well for us. Is it possible to propose another way to calculate it, or maybe this corrsponds well for others? The idea being that Gids is a measure of the current actual capacity of the battery, and Ahr is the measure of the maximum capacity of the battery with degradation included. I've implemented this now on the server, so hopefully it doesn't cause any issues and matches up better to your displayed SoC! I've also changed it so that it won't do anything with data that includes a negative SoC. Did you have any other ways you'd want the filter to behave? Today I Had a problem, I could not reach the service.